Home Real Issues Real Answers Real Issues. Real Answers. Hire or hold off? While business remains rock-solid in most markets, economists remind us that a slowdown is inevitable. 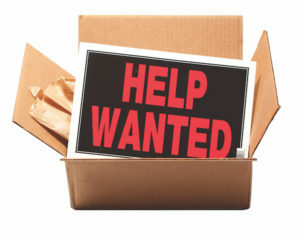 It’s impossible to know when that’s going to happen, but headlines about some prominent LBM dealers shutting stores prompted one reader to ask if he should fill a couple of open positions now, or hold off until the future is more certain. His question, which is at the heart of this month’s Real Issue, boils down to this: Hire or hold off? To learn how other readers would advise this dealer, we sent a very brief survey to the subscribers who’ve opted in to receive our email communications. A big thank you to the nearly 300 dealers who took time to weigh in. If you don’t receive our Real Issues surveys, and would like to be added to our opt-in list, please drop me an email at Rick@LBMJournal.com and we’ll get you added. While business remains very strong in most markets, an eventual economic slowdown is inevitable. How long do you believe it’ll be until the next slowdown affects your business? 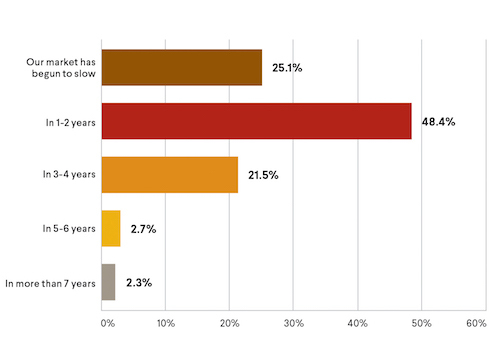 As the chart below shows, almost exactly one quarter of respondents (25.1%) report that their market has begun to slow, but nearly double that number (48.4%) believe that the next slowdown won’t begin for another year or two. Just over one-in-five respondents (21.5%) believe we’re still three or four years away. Comments to this question emphasize the regional variations in economic health, the impact of un- usual weather, along with a number of unknowns.